It took me a good year (with a couple of longer interuptions) to finish this one - and it has been worth every minute. It was a kit by Lanarte "Tutankamum", design is by Joandoor. I used the fabic in the kit (it's a printed fabric and it really adds to the piece) and all threads, except the metalic gold - I have no idea how the little that was in the kit should have been enough. I needed two spools of Kneinik 102 #4 braid, and there's not much left on the second spool. Of most of the colors there was plenty of thread left, though for a couple it was a bit tight. One color was missing when I got the kit (well, I got it half price in London, so no reason to complain), but a quick e-mail to Lanarte got me the DMC number I needed. If I ever come across Nefertiti in the same series in a sale (at least 25% off, prefered more) I'll get it too, but till then King Tut will be on his own. 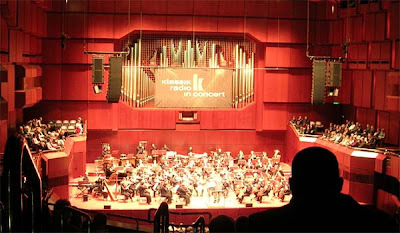 OnThursday I've went to a concert by the classic radio station. A symphonic orcestra of 60 people (as I counted them) playing movie scores. It took place in the old opera building in Frankfurt. The orcestra was pretty good, though the horns suffered a bit from not quite hitting a note now and again. I enjoyed the concert a lot, they had a nice selection of many of my favorites: Bernstein (Magnificent Seven), John Williams (Harry Potter, Indiana Jones and, of course, Star Wars), Hans Zimmer (Gladiator), Jerry Goldsmith (Gremilins) and many others. Last night was very cold but also very clear, so I dragged my Nikon outside, put it on a tripod and tried to make some star pictures. This a looking east from my balcony. 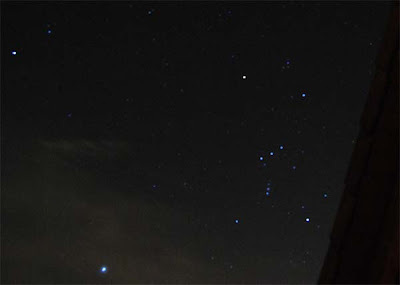 Orion to the right hand side. I decided I really need to get a remote release for the camera. Even with the tripod it's practically imposible to stop the picture from moving in a 10 seconds exposure (I have to leave the finger all the time on the release, so it's inevitable that the camera shakes a little). This is the best of the lot. 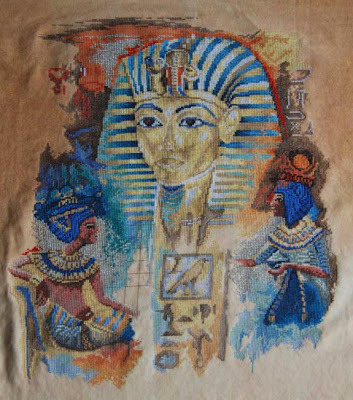 King Tut is making progress, though not update picture. Sorry. 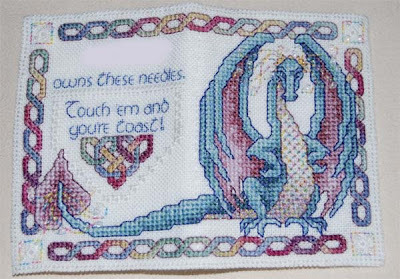 First finish of 2008: Needlecase Guardian by Teresa Wentzler. 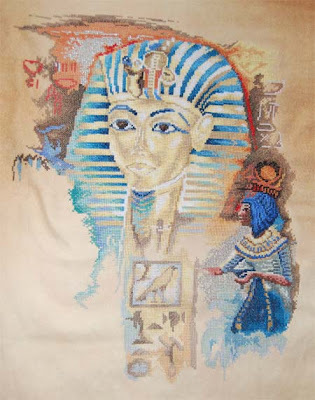 Stitched with all recomended threads on a 32ct anitque white linen. Didn't have the correct beads, but found a good replacement in my stash. 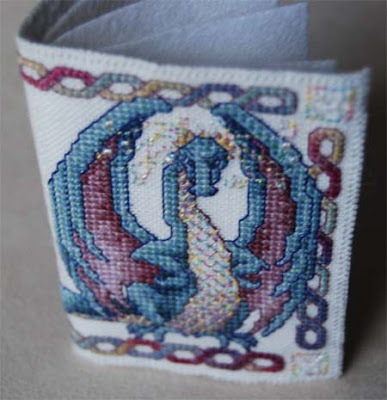 I finished it as a needle book, following the instructions. I really do love those smaller TWs - just enough to be a bit of a challenge, but not so much you're getting frustrated. 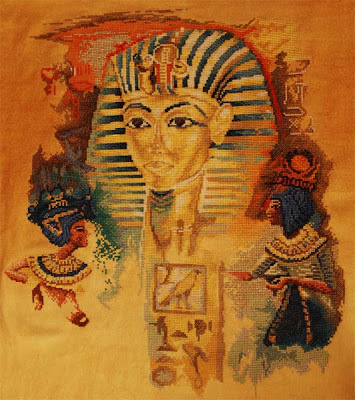 Following the early happy dance, I'm now back to good ol' King Tut. I finished the head dress, so 'only' (*cough, cough*) the left side lady is left to stitch.